For added privacy and control, you can stop sharing individual files. This is especially helpful when sharing with external users with whom you want to coauthor, but also want to stop sharing as soon as they are finished. Note: This may look different depending on your version. In OneDrive for Business, click Open Menu (…) next to the document. Click Share, and then click Shared with. Next to the person for whom you want to stop sharing, click Can Edit, and then click Stop Sharing. In OneDrive for Business, click Open menu (…) next to the document you want to share, and then click Share. Right-click the document you want to share, and then select Get a link. Tip: If you don't see Get a link, click Share, and then click Get a link. Choose Edit link – no sign-in required. Click Set expiration, and then choose how long before the link expires, such as 30 days. To copy the link to the clipboard, click Copy. Paste the link into an email and send it. Or, post it on a website for the people you want share with. If necessary, Use OneDrive on Android on your Android phone or tablet. In the app list, tap OneDrive. In any view, press and hold the file you want to stop sharing. Under Shared With, tap the person for whom you want to stop sharing. Note: You must be the owner of the file to stop sharing. If you see your name in the shared with list, you are probably not the owner. If necessary, install and set up OneDrive on your iPhone or iPad. Tap More (…), and then tap Details. Under Permissions, tap the person for whom you want to stop sharing. The ability to stop sharing a file is currently not supported on a Windows Phone. Now that Brian is finished with his edits, I'm going to stop sharing the document with him. 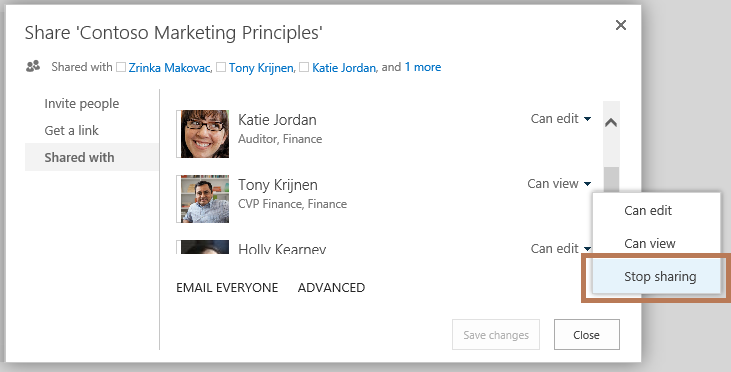 In OneDrive for Business, I click the Open menu next to the Package Design document, click Share, then Shared with. Next to Brian’s name, I click Can Edit, and then Stop Sharing. Now the document is only available to me and Zrinka.